You will be given a reference e-book to read which has 173 pages And the test will be based on that e-book , you can take final test within 1 year of purchase. Journalism refers to the process of reporting and investigating events, trends and issues to a broader audience. This field comes in many variations but its main idea is to consistently provide information to its targeted audience regarding topics that range from business organizations, government organizations and the cultural areas of society including arts and entertainment. It should be noted that this field also includes documentary, photojournalism and editing. At present, the status and the major roles played by journalism together with the different forms and types of mass media are now dealing with changes because of the web. This results to the ability of anyone to read or access news, features and any other forms of journalism on smart phones, e-readers and any other types of electronic devices instead of just accessing the printed media. Experts also define journalism as that specific practice which is concerned about reporting and investigating issues, trends and events for mass audiences of online, broadcast and print media including magazines, books, newspapers, radio, networks, television stations, mobile and social media and blogs. Experts in this field who are responsible in gathering and packaging information and news to disseminate to the masses are called journalists. It should also be noted that journalism comes with essential elements and components including design, editing, photography and writing. 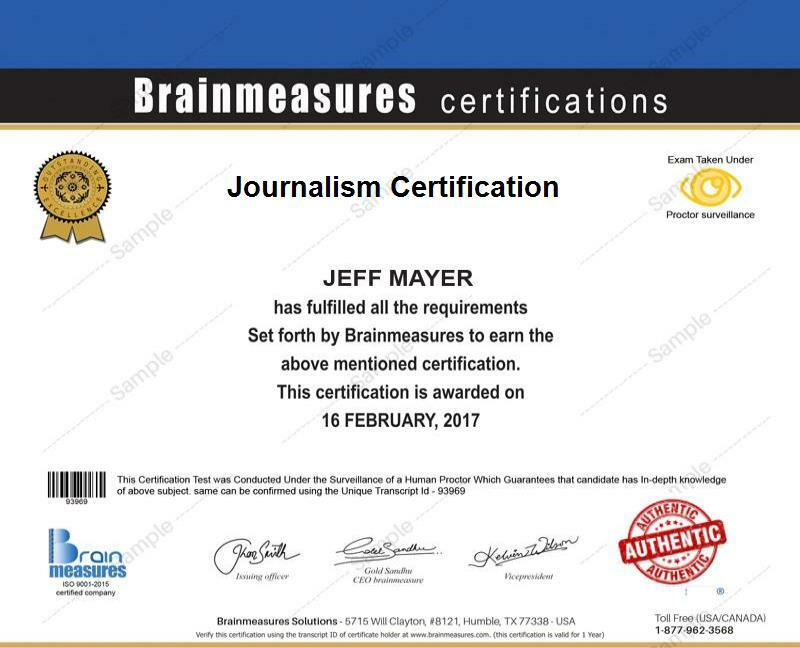 If you want to become a certified journalist or efficiently learn journalism, then be aware that the basic journalism certification program which is now available at Brainmeasures can work suitably for you. With the proven comprehensiveness of this journalism course, you will no longer experience difficulty mastering every relevant aspect linked to journalism. This certification course gives you the chance to access a high quality journalism training which is guaranteed to work in harnessing your skills and expertise in this specific area by offering essential and accurate information about the different types of journalism, the different ways through which information and news are disseminated to the public, different means through which people can access news and information and the skills and qualities needed to become one of the most effective journalists at present. Finishing up this journalism certification course entitles you to receive a certificate which works in showcasing your knowledge and the level of your proficiency in this essential field. How to become one of the most effective journalists? How to effectively gather news and make sure that you deliver the most accurate information to your intended audience? How to properly construct and edit news? The journalism certification program which is now easily accessible at Brainmeasures caters to the needs of everyone who aspire to become a huge part of the journalism industry. This online certification course works perfectly for all aspiring and existing journalists who wishes to improve their knowledge about journalism so they can continue delivering the most credible news and features to the public and impress people with their knowledge and skills in disseminating accurate information and creating news and reports that are worthy of being read. One thing that you will surely enjoy from finishing up a journalism certification course is a more stable income. If you are already a journalism certification holder, then your chances of becoming an editorial assistant will be increased and this is a major help in earning around $30,000 to $69,000 every year. Working as a certified journalist is also very rewarding considering its effectiveness in letting you enjoy around $37,000 to $92,000 annually.